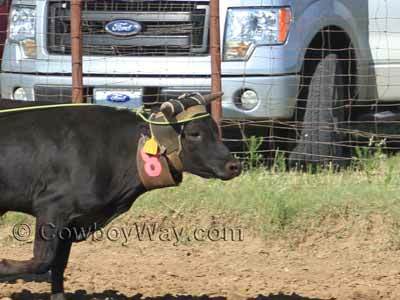 What Are The Three Legal Head Catches In Team Roping? In most organized team roping competitions the rules specify there are only three legal head catches. Other roping competitions, particularly if they use cattle of a similar type and size as team roping cattle, commonly allow only the same three catches. So, what are the three legal head catches? It's almost as straight forward as that, but not quite. For more information, please see the additional text and photos below. Common sense warning! 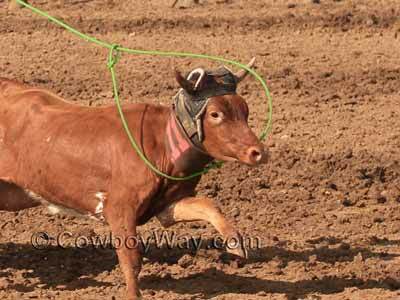 Rules for various roping competitions can and do vary, which means the information on this page won't apply to every situation. Always learn the rules for any particular event you may enter from the event organizers. The "around both horns" head catch is when the loop goes around and underneath the horns on both sides of the head. This catch is also called a "horn catch," a "clean horn catch," a "slick horn catch," or something similar. Below: An "around both horns" head catch. Notice the loop goes underneath the horns on both sides of the head. A "half head" catch is when the loop goes underneath the horn on one side of the head, under the chin or neck, and on top of the horn on the other side of the head. A half head catch is also called "half a head." Below: A half head catch just as it's going on, without all the slack out of the loop yet. 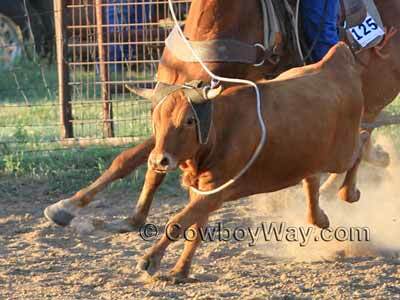 The "around the neck" catch is when the loop goes past the horns and settles around the neck. This catch is also called a "neck" or "neck catch." Below: An "around the neck" catch goes past the horns and settles around the neck. In each of the three legal head catches the loop has to make a clean circle around the critter's horns, half head, or neck. Put another way, the loop cannot cross itself (for example, in a figure 8 shape), or the catch is illegal. If the loop should pass through the critter's mouth (sometimes called a "bridle catch") the catch is illegal. If the honda of the rope catches on one of the critter's horns the catch is illegal. If the loop catches any of the legs the catch is illegal. Below: An illegal head catch because there is a front leg in the loop. 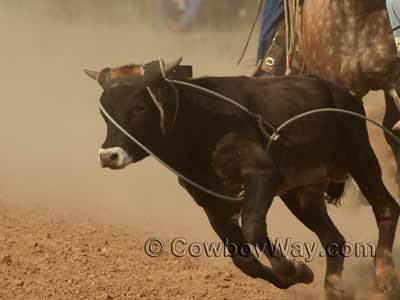 The three legal head catches rule applies to many competitive roping events, but certainly not to all of them. Exceptions to the rule, or different sets of rules entirely, are not uncommon. The three legal head catches rule also doesn't (necessarily) apply to roping cattle in non-competitive situations, such as in the pasture or the working pen. Whoever is in charge of overseeing the work usually has their own set of guidelines for how the cattle may be roped. Whether it's for competition or in the pasture or working pen, two common phrases often heard when roping cattle are "It's all legal in the pasture" and "Catch as catch can." These phrases mean that any head catch (or heel catch, for that matter) is acceptable. However, "It's all legal in the pasture" and "Catch as catch can" shouldn't be misunderstood to mean rough treatment of the cattle is acceptable. Common sense and good cattle handling techniques are still expected to apply. As you've probably noticed, the rules for the three legal head catches applies to cattle with horns. So, what happens if the cattle are polled or dehorned? That depends. Whether it's in competition or when working on a private cattle operation, you need to check the rules or get instructions from whoever's in charge. However, even when roping cattle that don't have horns you sometimes still hear the phrase, "It needs to be a legal head catch," or something similar. Since the cattle don't have horns it's often assumed you'll simply figure out for yourself that since you can't catch the horns or a half head, you'll need to make a legal neck catch.